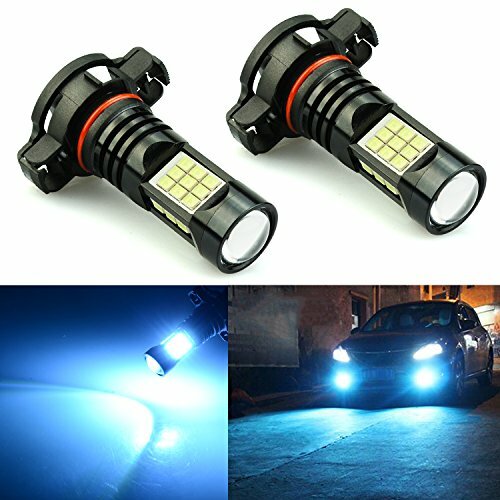 JDM ASTAR 2400 Lumens Extremely Bright PX Chips 2504 PSX24W LED Fog Light Bulbs for DRL or Fog Lights, Ice Blue by JDM ASTAR at Zona Indonesia. MPN: JDM ASTAR-2504-PX-27IBLUE. Hurry! Limited time offer. Offer valid only while supplies last. (Set of 2 Bulbs) Each bulb has 27 piece high power PX LED chips. Buy with confidence, We offer "ONE YEAR" warranty on item(s) that confirm to be manufacturer defect. Color:Ice Blue. Lighting Output：2400 raw lumens, 1200 lumens for each bulb. Voltage:12V to 24V. The bulbs equipped with constant-current driving IC and Aluminum Circuit Board. Fast thermal diffusion ,heat-resistant, no digital and VHF radio signal interference.